Image editing encompasses the processes of altering images, whether they be digital photographs, traditional analog photographs, or illustrations. Video editing is the process of editing segments of motion video production footage, special effects and sound recordings in the post production process. We mainly focused on three fundamental areas: single image haze removal, image filtering and image matting. 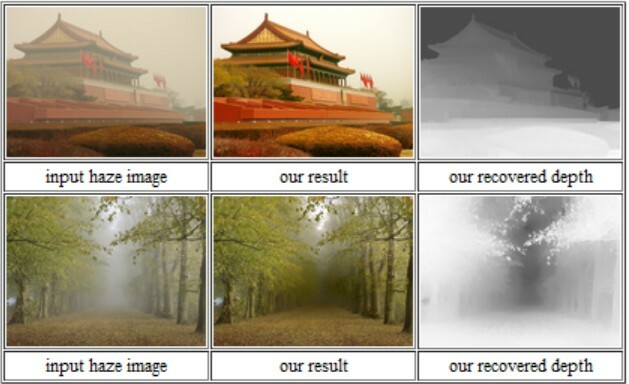 To emphasis, we proposed the dark channel prior to effectively remove haze from a single input image, and won the 2009 CVPR Best Paper Award. In this paper, we propose a novel explicit image filter called guided filter. 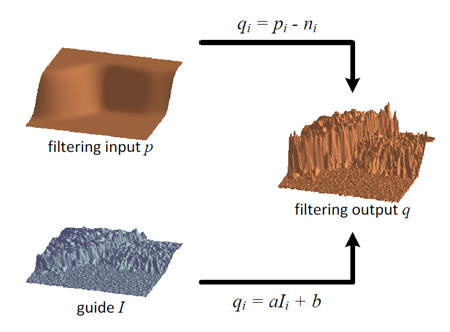 Derived from a local linear model, the guided filter computes the filtering output by considering the content of a guidance image, which can be the input image itself or another different image. The guided filter can be used as an edge-preserving smoothing operator like the popular bilateral filter , but it has better behaviors near edges. The guided filter is also a more generic concept beyond smoothing: It can transfer the structures of the guidance image to the filtering output, enabling new filtering applications like dehazing and guided feathering. Moreover, the guided filter naturally has a fast and nonapproximate linear time algorithm, regardless of the kernel size and the intensity range. Currently, it is one of the fastest edge-preserving filters. 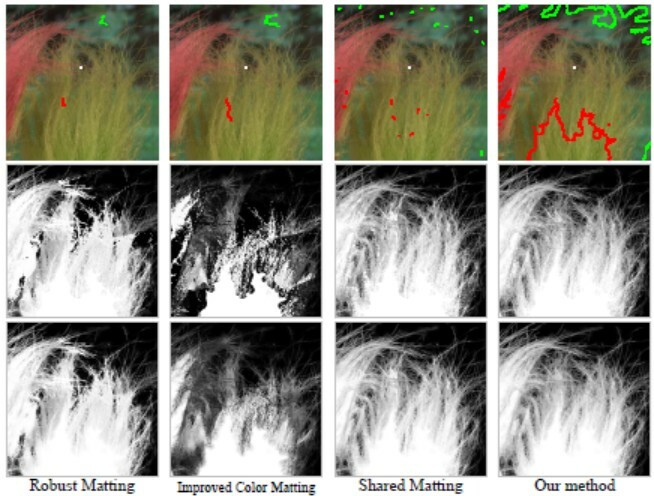 Experiments show that the guided filter is both effective and efficient in a great variety of computer vision and computer graphics applications, including edge-aware smoothing, detail enhancement, HDR compression, image matting/feathering, dehazing, joint psampling, etc. Alpha matting refers to the problem of softly extracting the foreground from an image. Given a trimap (specifying known foreground/background and unknown pixels), a straightforward way to compute the alpha value is to sample some known foreground and background colors for each unknown pixel. Existing sampling-based matting methods often collect samples near the unknown pixels only. They fail if good samples cannot be found nearby. In this paper, we propose a global sampling method that uses all samples available in the image. Our global sample set avoids missing good samples. A simple but effective cost function is defined to tackle the ambiguity in the sample selection process. To handle the computational complexity introduced by the large number of samples, we pose the sampling task as a correspondence problem. The correspondence search is efficiently achieved by generalizing a randomized algorithm previously designed for patch matching. A variety of experiments show that our global sampling method produces both visually and quantitatively high-quality matting results. 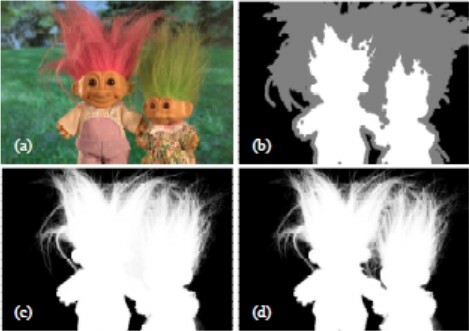 In this paper, we propose a simple but effective image prior—dark channel prior to remove haze from a single input image. The dark channel prior is a kind of statistics of outdoor haze-free images. It is based on a key observation—most local patches in outdoor haze-free images contain some pixels whose intensity is very low in at least one color channel. Using this prior with the haze imaging model, we can directly estimate the thickness of the haze and recover a high-quality haze-free image. Results on a variety of hazy images demonstrate the power of the proposed prior. Moreover, a high-quality depth map can also be obtained as a byproduct of haze removal. In this paper, we propose a novel type of explicit image filter guided filter. Derived from a local linear model, the guided filter generates the filtering output by considering the content of a guidance image, which can be the input image itself or another different image. The guided filter can perform as an edge-preserving smoothing operator like the popular bilateral filter , but has better behavior near the edges. It also has a theoretical connection with the matting Laplacian matrix , so is a more generic concept than a smoothing operator and can better utilize the structures in the guidance image. Moreover, the guided filter has a fast and non-approximate linear-time algorithm, whose computational complexity is independent of the filtering kernel size. We demonstrate that the guided filter is both effective and efficient in a great variety of computer vision and computer graphics applications including noise reduction, detail smoothing/enhancement, HDR compression, image matting/feathering, haze removal, and joint upsampling. fast method for high quality matting. We ﬁrst derive an efﬁcient algorithm to solve a large kernel matting Laplacian. A large kernel propagates information more quickly and may improve the matte quality. To further reduce running time, we also use adaptive kernel sizes by a KD-tree trimap segmentation technique. A variety of experiments show that our algorithm provides high quality results and is 5 to 20 times faster than previous methods. observation - most local patches in haze-free outdoor images contain some pixels which have very low intensities in at least one color channel. Using this prior with the haze imaging model, we can directly estimate the thickness of the haze and recover a high quality haze-free image. Results on a variety of outdoor haze images demonstrate the power of the proposed prior. Moreover, a high quality depth map can also be obtained as a by-product of haze removal.